There was a record crowd of 48,120 on hand at the Polo Grounds on December 11, 1938 as the New York Giants hosted the Green Bay Packers in the NFL Championship game. The Giants, coached by Steve Owen for the eighth year, started slowly with two losses in their first three games before catching fire and going 7-0-1 the rest of the way to top the Eastern Division with an 8-2-1 record. The roster was deep with talent. 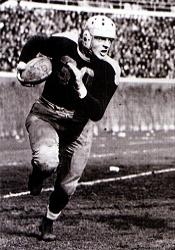 Rugged C/LB Mel Hein was voted the league’s MVP and was joined as a consensus first-team All-Pro by tailback Ed Danowski. New York had beaten the Packers during the regular season and had not given up more than 14 points in any game. Coach Curly Lambeau’s Packers had benefited from the arrival of rookie tailback Cecil Isbell, who alternated - and sometimes played halfback in the same backfield with - aging veteran tailback Arnie Herber. FB/LB Clarke Hinkle also handled much of the placekicking and was the league’s leading scorer. However, star end Don Hutson, the NFL’s most dangerous deep receiver who led the circuit in receiving yards (548) and touchdowns (9) while catching 32 passes, was out due to a knee injury – indeed, both clubs were heavily battered coming into the title game. It was a 31-degree day in New York City and the big home crowd saw the Giants take the early lead. On Green Bay’s second possession, the Packers chose to punt in a third-and-11 situation at their own 11 yard line and Hinkle’s kick was blocked by end Jim Lee Howell and recovered by back Leland Shaffer at the 7. The Packers allowed only one yard in three plays and New York settled for a 14-yard field goal by Ward Cuff. The next Green Bay series also ended with a punt, this time by Isbell, and again it was blocked. End Jim Poole accounted for the block and Howell recovered for the Giants at the Packers’ 28. Four plays later New York scored a touchdown on a 6-yard run by FB Tuffy Leemans. The extra point attempt by Johnny Gildea failed, but the Giants held a 9-0 lead at the end of the first quarter. The Packers got on the board in the second quarter following an interception by lineman Tiny Engebretsen. They capitalized with a 40-yard pass play from Herber to end Carl “Moose” Mulleneaux, filling in for Don Hutson, for a TD. Engebretsen successfully added the extra point and New York’s lead was cut to 9-7. The Packers put together another promising drive on their next series but FB Ed Jankowski fumbled the ball away at midfield. In a possession highlighted by a Leemans pass to wingback Len Barnum for 19 yards the Giants came back with a touchdown pass play of their own, with Danowski connecting with end Hap Bernard from 21 yards out. Ward Cuff added the PAT. Green Bay scored again before the half, going 80 yards in eight plays that included a 65-yard gain on a pass into the flat by Isbell to end Waylon Becker. Running down the sideline, Becker made it to the New York 17 before being hauled down by HB Hank Soar. Hinkle finished the drive by running for a one-yard TD. Again Engebretsen converted the extra point and the Giants held a slender 16-14 lead at halftime. The Packers went in front early in the third quarter thanks to a long gain into Giants territory by tailback Bob Monnett. Engebretsen booted a 15-yard field goal to make the score 17-16 and the early missed extra point attempt was looming large. 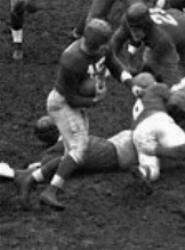 The Giants, starting the next series at their 39, moved methodically down the field as Hank Soar (pictured at top) carried on five of the first six plays. Soar threw an incomplete pass but then hauled in a throw from Danowski for nine yards to the Green Bay 26. After Soar ran for another three yards, Danowski went long and Soar pulled the pass down for a 23-yard touchdown, dragging Hinkle across the goal line. Cuff added the extra point and the home team was back in front by six points. There was still plenty of time and the Packers threatened repeatedly. Responding to the touchdown, they advanced to the New York 37 but turned the ball over on an interception. In the fourth quarter, Green Bay once again entered Giants territory thanks to Hinkle’s effective running, but was forced to punt. Later, in a key play, Herber completed a pass to end Milt Gantenbein for an apparent 16-yard gain to the New York 40, but the officials ruled that Gantenbein was an ineligible receiver and the Giants got possession at the Green Bay 45. New York had an opportunity to add to its lead but Cuff was wide on a 36-yard field goal attempt. In desperation, the Packers inserted Don Hutson, who had made a brief appearance in the second quarter, in the last minute of the game. Taking over at their 20 after Danowski punted into the end zone, time ran out for Green Bay as Herber’s last-ditch pass fell incomplete. The Giants were NFL Champions by a score of 23-17. The Packers rolled up more total yards (378 to 212) and first downs (14 to 10), but the blocked punts and Green Bay’s inability to put more points on the board when in New York territory made the difference. Hank Soar was the star on offense for the Giants with 65 yards on 21 rushing attempts and three catches for 41 more yards and a touchdown. Ed Danowski completed 7 of 11 passes for 77 yards and two TDs with none intercepted. For the Packers, Arnie Herber was successful on 5 of 14 throws for 123 yards and a touchdown with none intercepted while Cecil Isbell completed 3 of 5 passes for 91 yards and had one picked off. Clarke Hinkle (pictured at left) was the leading rusher with 63 yards on 8 carries that included a TD. Waylon Becker gained 79 yards on two pass receptions and Carl Mulleneaux also caught two for 54 yards and a touchdown. It had been an extremely hard-fought and physical game, and both Ward Cuff and the durable Mel Hein had to be taken to the hospital afterward. The two teams repeated as division champions in 1939 and there was a championship rematch in Milwaukee. The Packers came out on top this time with a 27-0 win.